The next day I pulled out all my seeds to sort and organize. I’m usually not one for throwing seeds away, but this year I decided a good seed box cleaning was in order, so I sorted the seed packets by the year they were packaged for, finding several dating back to 2001; anything older than 2009 will go into my compost bin garden. Appropriately named because any time I throw seeds into the compost (which isn’t often), they end up growing, which is why I hate throwing out seeds. With my “keep” and “discard” piles set I divided the “keep” pile into seeds that could be directly sown into the garden, like beets, radishes, beans and peas. Seeds like cucumbers, peppers and squash can be started in pots before transplanting out in the garden. 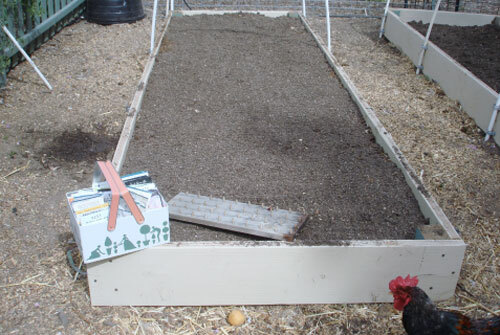 The “discard” seed packets were emptied into a glass jar and divided between the two compost bins. It’s an odd thing I know, but I won’t give up on their viability. I just won’t waste time, hard work and water planting seeds that will have a much reduced germination rate. With the wind still howling outside I moved into the garage and set up a makeshift planting bench (outside planting would have to wait until the wind died down). I moved between bags of potting soil, peat moss and perlite like a baker in his kitchen, mixing up batches of a light seed starting mix. I then gathered my array of pots and started filling them. By the time the sun began to set and I called it quits for the day I had planted cucumbers, peppers, broccoli, cabbage, cauliflower, more tomatoes, melons, squash, pumpkins and zucchini; almost 150 pots in all. By Sunday the wind had slowed down to a breeze that was pleasant enough to work in. 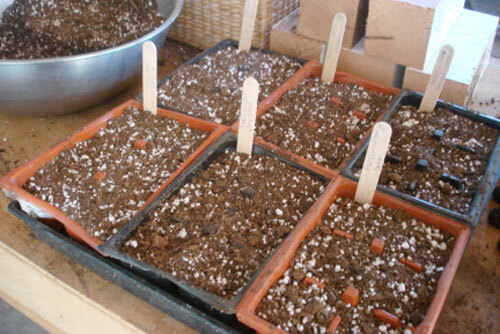 With my box of “direct sow” seeds, a handful of plant labels and a pen I headed out into the sun. The temperature had risen a bit; that combined with the movement of air made the sweaty job of preparing the beds a pleasant one. Section-by-section I raked and smoothed and de-clumped the soil, making it the perfect home for the seeds to come. Looking down at those beds I felt proud. In just a few short weeks our farmhouse would be feasting on vegetables grown just feet from our back door. There would be no more running to the market – farmers or any other. Our market would be a plot of ground that lay just outside the chicken coop. But first the seeds must get into the ground. On my hands and knees I pressed my homemade multi-seed dibble into the prepared ground, making perfectly spaced holes for each variety. Bed One would be the salad garden, full of beets, radishes, carrots, onions, leeks, parsnips, spinach and a variety of head and leaf lettuces. A full array of root veggies with names like Bull’s Blood, Dragon Tongue, Easter Egg, American Flag and Bianca Di Maggio; and leafy greens named Tom Thumb, Little Gem, Grandpa Admires, Red Rapids, Forellenschuss and Lavewa would adorn our table just in time for Easter. I moved steadily, from dibble to seeding to labeling. Like a dance of dirt and seed, I planted my salad garden in just under an hour. With the mid-day weather heating up it was time for a break and glass of cold tea. I sat under the eves of the barn looking out over the newly planted bed and dreaming of how the garden would look in full production. My plans are grand for our little farm—more gardens, more fruit trees, a re-located berry bed, a new greenhouse, and new pens for the meat chickens and ducks. My mind reeled at the possibilities, but for now the job was to plant another full bed. Bed Two would be our pea and bean bed. Along the sides of the bed Brianne and I staked two spare livestock fence panels to give the peas and beans a place to climb. Down the center of the bed we planted four different kinds of bush beans in colors of purple, yellow and green. When all the work was finished each bed got a good soaking of water and a fence barricade to keep marauding chickens and rabbits from destroying our work. In just 3 days of hard but pleasurable work we have created food security for our little farm. No matter where you live or how large or small your growing area may be, you too can provide some of the vegetables and fruits your family eats. Just give it a try! I think you’ll be surprised.